I took the train to work this morning. As usual, the train carriages were crowded. A pregnant woman was standing for most of the way until the guy sitting next to me noticed that she was pregnant, and moving unsteadily on her feet. The people sitting around her pretty much ignored her, some reading their papers, another stared out the window and another busy putting warpaint on her eyes. All ladies I must say. The guy next to me stood up and the woman had to pushed her way through a couple of other people before arriving at his seat. Not only did she thank him, but she also commented that it was the first time anyone has ever offered her a seat while being pregnant. Are Melbourians becoming less kind, less caring? I wished I saw her first. I’ve been watching the soccer match between Australia and Greece. Does someone want to take up the challenge of explaining the offside rule to me? I like to know how good the eye sight of that referee is to be able to see the ball being kicked from the other end of the field. I mean I was barely able to do it on tele from the high angle shot. All those fouls and tee-shirts pulling … wouldn’t it be nice if someone design tee-shirts which are pressure sensitive such that it will record hand prints, or a shoe print for up to a minute. Just so to prove or to disprove whether fouls had been committed. Or a cheaper idea, make all players wear mittens, non of the players will be able to grab anything! Photo sharing is built into us, and the community has come together via a photo-sharing site, Flickr. For 19 photographers, they’ve now brought this into the physical, by holding an exhibition. Themed around Melbourne, the 19 have 91 photos showing their love of Melbourne. The show is on from 24 May (today!) right till the 11 June. 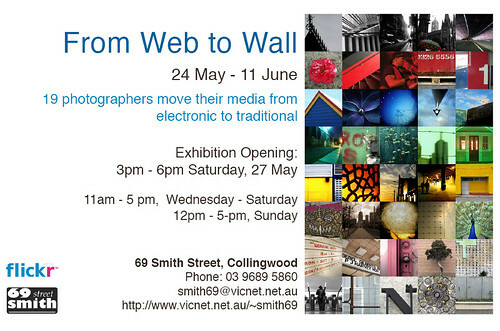 An opening is being held on Saturday, 27 May from 3pm – 6pm, held at 69, Smith Street, Collingwood. The gallery is open from 11am – 5pm Wednesday till Saturday, while it opens from noon – 5pm on Sundays. The 69 Smith Street Gallery is located in Collingwood, and is reachable by tram 86. Come one, come all. And see you at the opening! Is shopping at an IGA costlier than your local Coles or Safeway? I went into my first IGA yesterday to pick up a bunch of groceries – milk, some cheese, a dip, a pack of tissues, and I was set back about $21. They didn’t even offer to give me a receipt! I noted something seemed odd when a 2L milk cost $4.10 or thereabouts. Now I’m not a penny pincher, but wouldn’t independent grocers tend to be cheaper than the actual chains? I guess the next time I visit Coles, I’ll be sure to check how much the whole deal costs. I have just returned from the supermarket and observed a new phenomenon. The shopper in the queue requested the cashier scanned as many items until $30 has been reached. So, in the end, the shopping trolley was divided into 2 transactions of approximtely $30 each. This little exercise resulted in two separate fuel vouchers. You are doing the same thing to try to reduce your petrol costs? Don’t do it, on a train. It could just be your unlucky day where the coppers are on board and will issue you with a nice little fine. While sitting on my train ride home today, someone did just that at the South Yarra station. He wedged his bag into the door, the train doors reopened again, and he came in. Within a few seconds, the police asked him for his ID and wrote a note of infringement, and will hand it over to the appropriate authorities. He tried to wiggle his way out of it, but in the end just accepted the fact that he was in a rut. Now, it would seem that when the police officers are on board the train, they actually look out the doors at every stop to see if folk are running in. I presume the moment the train doors open for the second time (implying someone has tried to force the door open) the find it easy to look out and catch the offender. Found a new cafe for a great curry in the city. I’m not sure the exact name of the place, I tend to think its the Gold and Fork restaurant but the receipt states that it is part of the Bismi consortium. They are located near the junction of Elizabeth and LaTrobe Street, next to the Natural homeotherapy place. Anyhow, I love their curry. I think they must be quite authentic as well, because I’ve seen lots of overseas students in there, as well as the some members of the Indian Commonwealth team during the Commonwealth Games (such a long time ago). My recommendation is to try their Thali meals for $10 available during lunch time. You can have it either with bread or rice. This is served with several small bowls of curry, either with meat or simply vegetarian. It does not look much, but very filling. The meal comes with an apple and a cold drink. Just the thing on winter days. Down with the flu (again). It is becoming quite a tradition with me. But as I was walking down the street to work, I realised what is missing in the city of Melbourne this winter. Little corner temporary stores selling hot soups in a cup! What do you think? I know this flu is getting me down, and I am craving for a hot cup of soup, but anything hot without caffeine should make anyone feel better this winter. There used to be stalls selling chestnuts and stuff but selling soup, maybe in a breadbowl …. yummy! This has been on the news all day. The building house the school of business of RMIT has closed the top 2 storeys. I’ve seen that building. They are located along Bourke Street, opposite the Target shopping complex. The current rumour is that Telstra has 2 mobile phone towers on the roof of that building and that could be the reason causing the staff to be ill. What is the likelihood that 7 staff working in the building develop brain tumours in the past 7 years? Many researchers will say there is insufficient evidence to prove that the electromagnetic radiation from the towers caused the tumours but what is the chances that people working together in the same building, in the same school, develop similar tumours within a time frame. I think the probability of winning the lottery is much higher. But, it could be in the water and air in the building.